A longtime Missouri state trooper served as Santa Claus for the fifth straight year at the recent Operation T.O.Y.S. event in Jefferson City, where law enforcement officers took about 100 needy children Christmas shopping. Tim Hull, who spent 32 years with the Patrol before retiring as a Captain in 2015, tells Missourinet he’s participated in the Jefferson City event in various roles since 1992. 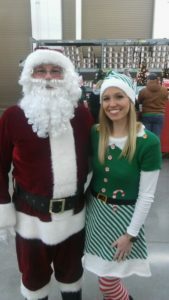 Hull replaced former Missouri state trooper Chris Ricks as Santa, after Mr. Ricks died in 2014. 101 needy children are enjoying the early Christmas presents, thanks to the event. Many of the children were jumping up and down when Santa Claus arrived on December 15. Hull choked-up, when speaking to a Missourinet reporter about the experience. “It’s kind of nice to see that these families that wouldn’t normally be able to afford gifts for their children can now have a nice Christmas for them,” says Hull. Hull says the event also helps build better relationships between police and the community. He says the event ties-in with community policing and outreach programs. He notes many of the children were focused on purchasing gifts for their siblings and parents. “It’s kind of a good feeling to know that feeling of giving not only is there for these officers and all these other people, but is also there for those kids that are the spotlight today,” Hull says. Each child was able to purchase $150 in gifts at a Walmart and many of the children purchased winter coats and gloves. Operation T.O.Y.S. stands for “Take Our Youth Shopping.” Donations from the community and from businesses funded the annual event, and officers from nine agencies participated. Hull, who served with the Missouri State Highway Patrol from 1983 until his 2015 retirement, is now the executive director of Missouri Operation Lifesaver. It’s an organization that promotes rail safety education in Missouri.